The voice of the FreeBSD Community and the BEST way to keep up with the latest releases and new developments in FreeBSD is going Free. Yes, Free! 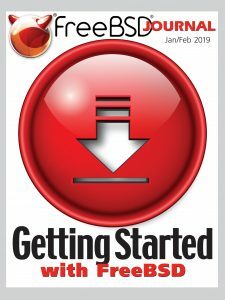 Beginning with the January/February 2019 issue, the FreeBSD Journal will transition into a free publication. Read more in the FAQ about our reasons for moving to a free subscription model and what other changes are happening with the upcoming issue. Please note: We are also debuting a new registration form. Current browser-based subscribers who are already logged in will see an abbreviated version of the new form featuring two new questions. These are not required questions, though your input is very helpful for future planning. FreeBSD Developer, Member of the FreeBSD Core Team, and Co-Chair of the FreeBSD Journal Editorial Board. Founder of the FreeBSD Foundation, Director of the FreeBSD Foundation Board, and a Software Engineer at Facebook. Senior Software Engineer at Dell EMC, and author of FreeBSD Device Drivers. Member of the FreeBSD Ports Team. Director of Storage Engineering at iXsystems, Chair of the BSD Certification Group, and author of BSD Hacks. Director of Project Development, FreeBSD Foundation. Treasurer of the FreeBSD Foundation Board and lead author of the Design and Implementation book series. President of the FreeBSD Foundation Board and co-author of The Design and Implementation of the FreeBSD Operating System. Secretary of the FreeBSD Foundation Board, FreeBSD Committer, and Independent Consultant. Director of the FreeBSD Foundation Board, Chair of AsianBSDCon, Member of the FreeBSD Core Team, and Assistant Professor at Tokyo Institute of Technology. Vice President of the FreeBSD Foundation Board and a FreeBSD Documentation Committer, and member of the FreeBSD Core Team. Director of the FreeBSD Foundation Board, Founder of the TrustedBSD Project, and University Senior Lecturer at the University of Cambridge.